Governor Greg Abbott today signed legislation banning sanctuary cities in the state of Texas. Senate Bill 4 (SB 4) requires local government entities and law enforcement officials to comply with federal immigration laws and detainer requests, and creates criminal penalties for entities that do not enforce the law. Banning sanctuary cities was one of Governor Abbott’s emergency legislative priorities. “As Governor, my top priority is public safety, and this bill furthers that objective by keeping dangerous criminals off our streets,” said Governor Abbott. It’s inexcusable to release individuals from jail that have been charged with heinous crimes like sexual assault against minors, domestic violence and robbery. There are deadly consequences to not enforcing the law, and Texas has now become a state where those practices are not tolerated. With this bill we are doing away with those that seek to promote lawlessness in Texas. 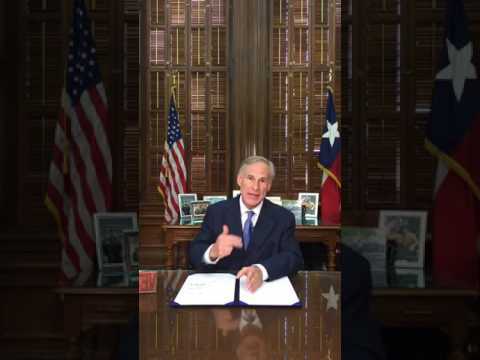 Watch the video of Governor Abbott signing Senate Bill 4 into law. Senate Bill 4 will go into effect on September 1, 2017.